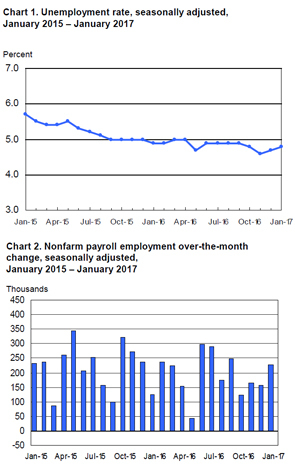 Starting the first month of the year off strong and marking the last set of employment data representing the previous administration, the U.S. labor market added 70,000 more jobs in January than in December 2016, according to the Employment Situation Summary released by the Bureau of Labor Statistics. Though a steady increase in job growth was forecasted for last month, estimates were well under the 227,000 jobs actually added in January. Analysts surveyed by Bloomberg forecasted just 180,000 jobs to be created, according to the source. The New York Times however did report that several analysts on Wall Street were expecting closer to 200,000 jobs based on data released Wednesday from ADP, a human resources company that processes payrolls. According to Bloomberg, the number of jobs added was the highest in four months, fueled largely by the construction industry. Recording the largest increase in payrolls since March 2016, the sector added 36,000 positions. Residential construction created 9,000 more jobs while the number of contractors in residential specialty trade grew by 11,000. Since January of last year, the construction industry has generated 170,000 positions. Also fueling the growth in total nonfarm payroll employment were the retail trade and financial activities sectors. There were 46,000 jobs created in the retail trade industry – in clothing and clothing accessories stores, electronics and appliance stores and furniture and home furnishing stores. Financial activities saw 32,000 positions added in January. Though little changed, the unemployment rate did edge up slightly at 4.8 percent for the month of January, according to The New York Times. While some report close to full employment in the U.S., economists from Moody’s Analytics noted that the economy still has room before reaching full employment. This is based on five additional measures not including the unemployment rate. After picking up toward the end of 2016, wage growth seems to have slowed again. Though minimum-wages have increased in some states, across the job market there was only a 0.1 percent rise in average hourly earnings.